Real Estate Magnets 2013 – Why are they Lucky Promotional Signs for Realtors? Big and small time realtors often use term “survival of the fittest” to remark their struggles in the niche sector. This is absolutely true given to the fact that world economy is slowly emerging from the clutches of great recession of 2008 and people are getting serious about making property investments. As a result large number of “sharky realtors” has started promising big relief and right properties to the wannabe and potential buyers. Unpredictable business landscape has jolted some established realtors to step out of their comfort zone and reach out to their customers. Real estate magnets are one effective promotional token extensively used for brand building. Wide canvas for experimentation – Unlike earlier years, now magnetic signs offer larger experimentation space for advertisers. Some of the popular realtor magnets of the season such as real estate calendar magnets, home calendar magnets, and land calendar magnets leave plenty of room for experimentation. Today, realtors can think of creating magnets in every imaginable shape and size to attract their customers. 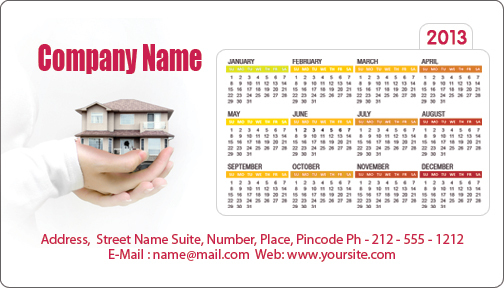 Real estate house shaped magnets are being largely favored by advertisers in 2013 for promoting their business. Easy Visibility Over Regular Promotional Tools – Now, you may ask wasn’t it there earlier too? Yes, realtor magnets offered easy visibility over regular promotional tools, but advancement in printing technologies it has become extremely comfortable for the suppliers to offer tailor made choices. Nowadays, you can seek custom magnets tailor made to suit your promotional requirements. For example – realtors are trying to cut through the competition by ordering larger real estate business card magnets. Advertisers can choose to improve their readability factor by including some value added information such as dates or public holidays etc on back side of the magnet. This act will not only help to improve the retention ratio of a magnet, but also works in favor of realtor. Realtor business card magnets make a wonderful promotional tool for realtors during trade shows or other promotional events. Value Effectiveness – The most interesting part of involving real estate magnets 2o13 remains in their value effectiveness. They not only serve as plain promotional tokens, but also pack immense potential to keep inspiring customers in many other ways. They can use it over refrigerator doors, for some referencing purposes and of course as a peachy indulgence during the times of need. Realtors can perhaps recount many more benefits of real estate magnets by employing them for the promotions and they will agree that real estate magnets 2013 offer them luckier spell than earlier years by helping them to distinguish from others in niche.